Chop up the potatoes, leeks and celery to 1/2 inch pieces. Heat up olive oil and saute the onions till they are translucent. Add the garlic and bay leaves and saute for a minute. Add all the veggies and cover it up with water. Add salt and let this simmer away till the veggies are cooked well. Take half the soup out, let it cool down and then puree it. To the other half that is on the stove, add uncooked orzo, barley and chopped parsley. Continue cooking till the pasta is done. Dilute it further if required. Now add the pureed half and add salt and pepper according to taste. Garnish with parsley and serve hot. What would you eat when hubby is not in town for a weekend and you are at home looking after your toddler? Left overs? Maggi noodles? Yeah, thats what I usually do especially since he does not travel that often. My attitude – ‘Why cook for one person?’. And then the little one keeps me busy. So, it is not like I have nothing to do. This was one of those occasions, H was out attending a conference. (BTW, I have no idea why they need to start registration on a Saturday and have the key note speech on a Sunday. What are weekdays for?) Anyway, I was at home craving Italian and actually decided to make some pasta for myself. But guilt pricked at the wrong time…how could I eat something he likes and then enjoy the meal? And worse still – I couldn’t believe I was thinking like my mother. I had always made fun of her about being too sentimental over such things. Start with the veggies. Add the olive oil to a pan and then the veggies. Saute for 3-4 minutes and transfer it to a bowl. In the same pan, Add the butter and once it melts the flour goes in. Roast it till the raw smell goes and then add the milk. Let this thicken up and then add the cheese, salt and pepper to the simmering white sauce. Add the veggies, give it a stir and switch off the stove. Let this cool down and fill it into a puff pastry sheet. Poke some holes on it and bake according to manufacturer’s instructions on the puff pastry carton. What I made was actually nothing close to the classic pot pie. The pot pie usually has a biscuit crust and I substituted it with a puff pastry sheet. There was no cream, mushroom or potatoes in it. It was something I seeked refuge in for the day but I did have a meal that was not just delicious, but utterly filling too! I loved it and now, I am waiting for my husband to attend another conference:) The next time, I would cut the quantities in half and also use the oven-safe bowl that I bought soon after. It was a cold, lazy weekend afternoon early last year. The little one was happily tucked away into her blanket for a nap and dear hubby was watching football. I was flipping through one of the baking books I had bought recently and a recipe caught my attention – Sourdough bread. We both love this bread and always bought it from the store. Can it be made at home? Then, began an extensive research for methods and ingredients on the internet. What I found was quite fascinating. You mix all-purpose flour and water and leave it in a warm open place for a few days with frequent monitoring. The batter picks up yeast and bacteria from the environment, starts bubbling and turns sour. This would be the starter. The quality of a starter would depend on where you live and whether the batter picks up the right guys. San-Francisco starters are supposed to be the best. Also, once someone has a starter going, it is fed periodically and kept alive for a long, long time – for generations sometimes. I tried. The first time, nothing happened. February was a cold month (Yeah! sometimes, even in Florida) and so, I decided to wait for the spring. I gave it another shot in March. This time it looked like things were happening and I saw some bubbles on day 3. It was exciting! I added half a cup of all-purpose flour and warm water everyday, for the next 4 days. It got bubblier. It was time to try out my very own bread….or so I thought! I mixed more flour, sugar, salt and waited for it to rise to twice its size. I waited, waited and waited even more! It rose but not to the extent described in the cookbooks and internet sites. With a heavy heart I punched it back in for the second rise. Waited for 3 more hours for the rise and baked it. What came out was a shame. The crust was too thick, the inside was no-where close to being called soft and the taste…I had…ahem…added a little too much salt. Totally frustrated with my first attempt, I put off the thought of baking bread for a while. I still kept the starter alive for a few more months. It was not before June, that I made my second unsuccessful attempt and dumped my starter in disgust and decided not to venture into the bread making business anymore. Then, in September, THIS happened! I read through the post at least 3 times before I left a comment. Few days later, she baked her first biscuits. Now, this was exciting. I left another comment and she replied ‘Thanks, Hema! If you want to give it a shot, I’m more than happy to pass along some starter anytime’. Really? I wrote back to her with my mailing address and sure enough received this package with some dried starter and a lovely little note with instructions. She actually took time and dried some starter for me. Yes, she is our very own ‘Out of the wor…garden – Linda!’. Thanks Linda! You are awesome! I stored the dry starter in the refrigerator for over two months before I got a chance to get working with it. I followed Linda’s instructions and pretty soon the starter was bubbling with activity. A day before I decided to take the plunge, I added a cup of flour and half a cup of warm water to the starter. Next morning, I took a cup of starter for the bread and stored the rest in the refrigerator. With it went in ½ tsp sugar and 1 tsp salt. Then, I cheated (blush). Well, you see I have had horrible sourdough experiences in the past and really wanted soft bread this time. So, I added some commercial yeast…just a pinch, actually (blush, blush). Dissolved it in a tbsp of warm water and added it to the dough after 5 minutes. Then I added flour(about 1 cup), one spoon at a time till the consistency felt right – soft and workable, but not sticking to your hands. I brushed some olive oil on it and let it rise in a warm place (oven with lights on). It rose to twice its size in about 2 hours! YAY! I punched it back in and this time put it into my loaf pan for the second rise. 2 hours later, I made a slash on the top and popped it into the 425 F preheated oven for 8 minutes and then reduced the temperature to 375 F and baked it further for another 20 minutes till the crust turned golden brown. Out came my precious bread, with my home smelling like a bakery:) I let it cool and gave hubby the honour of cutting my first bread and taking this picture. It was soft and tasted almost like what we get at stores..a little less sour, but that maybe because of the extra yeast I added. Now, I can proudly say baking bread is not a big deal’. Thanks Linda. Could’nt have done it without your help. 5 things the world doesnt know about me! was tagged by Coffee of My Khazana. Thanks coffee! 1. Let me start with something my blogger friends don’t know about me. I am an Environmental engineer approaching the big 3-0. Yeah, that feels old. Crossing 25 did’nt feel that bad. From, a career oriented graduate in search of a challenging job 5 years back, I have now transformed into a wife and a mom, whose priorities have changed for good. I still work and sure I love my job, but more so because it is not challenging and allows me to spare the time I need for my family. 3. I have rotten molars. Yeah, I never brushed ‘twice a day’ as a kid, how much ever my mother begged and pleaded and then my teeth bore the brunt of eating all those chocolates at bedtime. 2 root canals and 4 fillings at age 15! The good part is, I can now show my daughter what could happen to her teeth if she didn’t take care of them well. 4. I love gazing at stars on a clear night. I feel, there is nothing more breathtaking than the beauty of the black sky sprinkled with glittering stars. Oh! how I miss our terrace back home. 5. I hate snakes and I hate driving at night. What’s the connection? I often have this thought – What do I do, if I find a snake in my car while driving on a freeway at night? It gives me the creeps. Dont laugh now, give me a solution to the problem! I have not been able to come up with one yet. Keep in mind, I will not be in my right senses at that time. Now, that was fun. Not sure who has already been tagged and who hasn’t. So, here are a few names I picked just because I see they do not have anything written up yet. Play it if you want to, Prema, Priya, Mythili, Archana and Archana! Yesterday, I spotted a bag of frozen aamlas at the Indian store and grabbed it greedily. This was the first time I had laid eyes on amlas in the 5 years that I have lived in the USA. Well, I should say, this was the first time I noticed. Last month when I spoke to amma, she said aamlas were available for Rs.10 a Kg. What I bought was maybe a 200g bag of frozen aamlas for $1.99 (quick and rounded calculation – Rs.100). I could have bought 10 kgs of amla for the same price! It has been a while since I did such calculations. New to this country as a student, back in 2001, it was my regular habit to convert dollars to rupees for every purchase and go ‘Rs.2000 for a week’s worth of grocery?’ or ‘Rs.150 for a cup of coffee at starbucks?’. But now, when I go to India, I do the calculations other way around and feel happy about how much I saved. I still can’t tune my brain to work in miles, faranheit and pounds though. Why the US doesn’t follow the metric system still beats me. The ‘think metric’ photo at Mythili’s blog really made me smile. Anyway, back to aamlas. 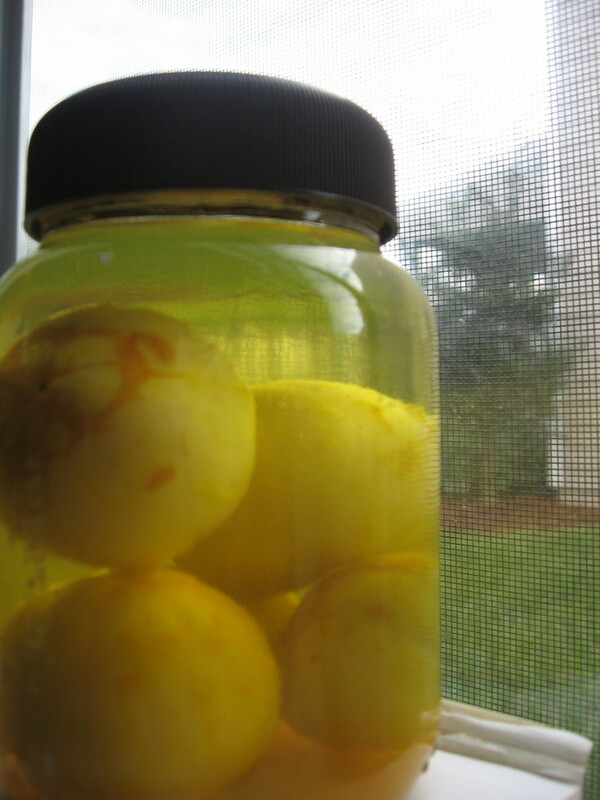 The best way I like to eat them is by soaking them in brine for a few days, which is what I did right after getting back home. You need a glass bottle with a leakproof lid. Make brine with water and required amount of salt. I would say about a tablespoon for every cup of water. Add some turmeric and drop in the aamlas. Make sure you give the bottle a good shake once in two days. In about 4-5 days they will soak up the salt and swell up with flavour. Enjoy! 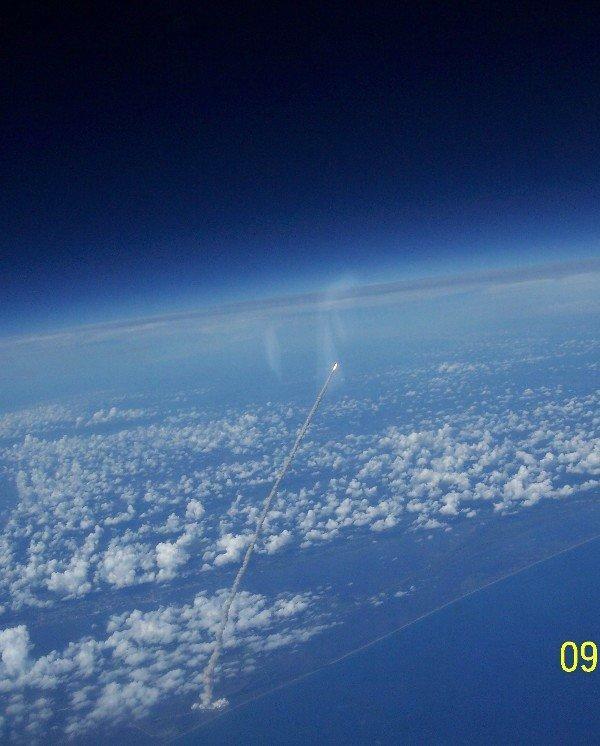 Have you ever wondered how a launch would look from realms beyond the earth? I got these snaps as attachments in an email. Just thought I could share them with you. Here’s something that you don’t see every day……. Space Station happened to be passing by when the Shuttle ‘Atlantis’ launched. 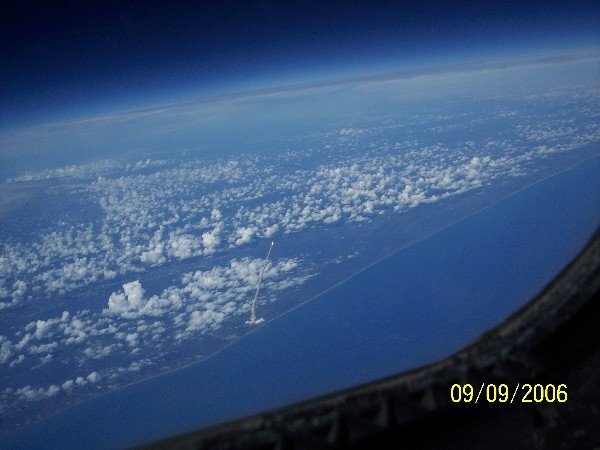 The launch, as seen from the International Space Station (09/09/06).